Olde Green Cupboard Designs: It's almost here!! 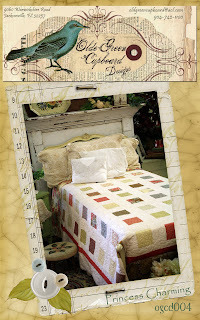 Yes.... it's almost time for our first quilt market... well, the first time we will be vending at a "wholesale" market. VERY SCARY! Vic and worked on the design of our booth. It sure doesn't take long to fill up a 10 x 10 booth. It will be so wonderful and exciting. I'm attempting to attach some of the pattern photos for you each to take a peak at!!! 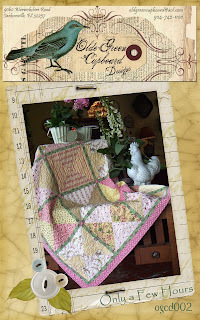 This is my 6 month block-of-the month! I simply love this quilt. The background for the wool applique pieces are ticking dish towels. The texture is super and looks great with the wool. My flying geese are fabrics that compliment the wool colors. We'll have all of these on the website soon! 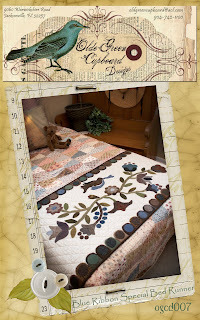 Pretty Pots A Plenty - This is a wonderful scrappy quilt! The one on the bed Vicky just finished. We used all soft small print fabrics.... It's so sweet.... I just want to roll up in it. The pastel sample on the church pew is Cathy Peter's! This is shabby chic from the word GO. It matches her sewing room perfectly. 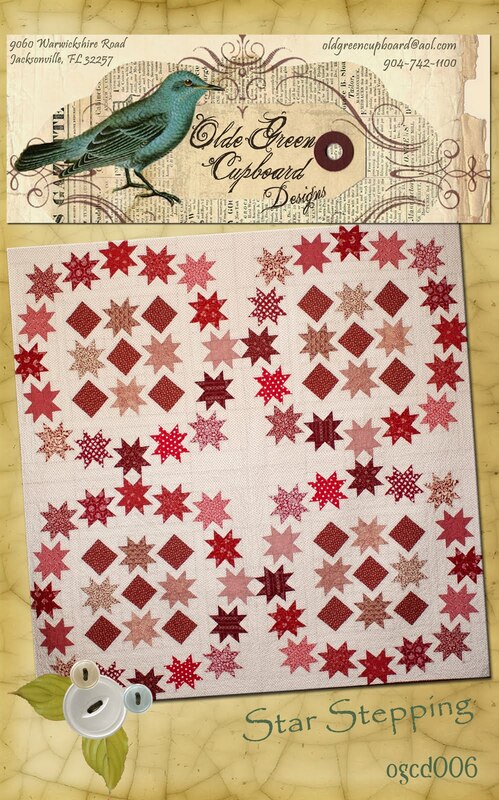 This is a super pattern to cut all your scraps up as you go. We have one finished in all plaid homespuns. It's aweome... guys really love that one. Blue Ribbon Special Bed Runner - Remember when you go into a hotel room and they have that silly little piece of "bedspread" at the foot of your bed? Well... it gave me the idea to add an extra pretty runner to the foot of your bed. OR.. use this as a table runner. The length can be adjusted very easy. 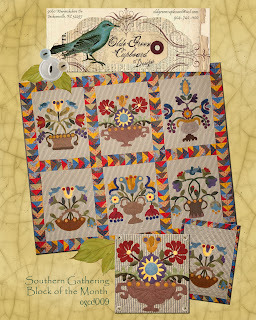 Our beautiful flowers, vines, leaves and bird with her blue ribbon are all wool - appliqued onto a cotton background. 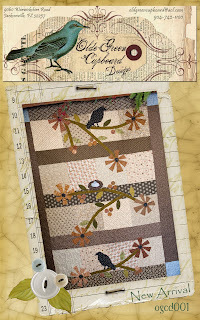 I had a great time making this piece... and it can be a Blue Ribbon winner for you too!! It's very easy to use wool colors that compliment your quilt or bedspread! 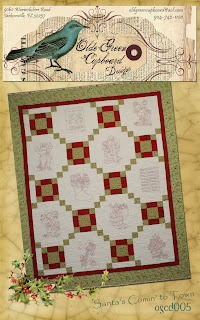 You just can't beat a read and white quilt...put scrappy reds and shirtings together and it's even more than wonderful! 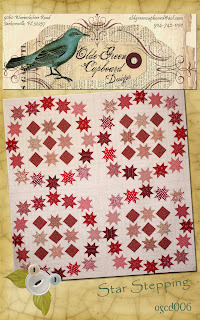 This is a great pattern... if you want a small table topper... just make one section and you're all set! I'm hoping this will be a show stopper! It sure is in my book! Santa is Com ing to Town! This adorable quilt comes to you from an antique children's Christmas coloring book. We've added our two cute blocks of our Santa's Letter and the famous Christmas poem to round out the blocks. You'll have a wonderful time stitching these wonderful Santas. Then put them into any Christmas fabric of your choice. 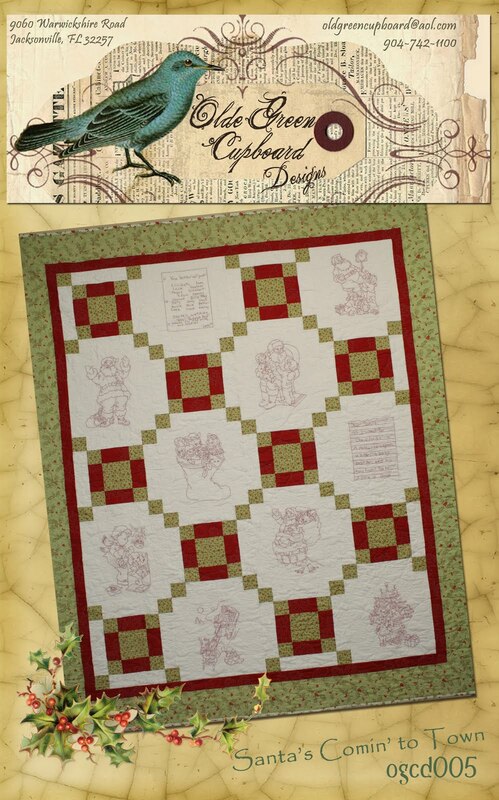 It's a great quilt for the family to use during the holidays! 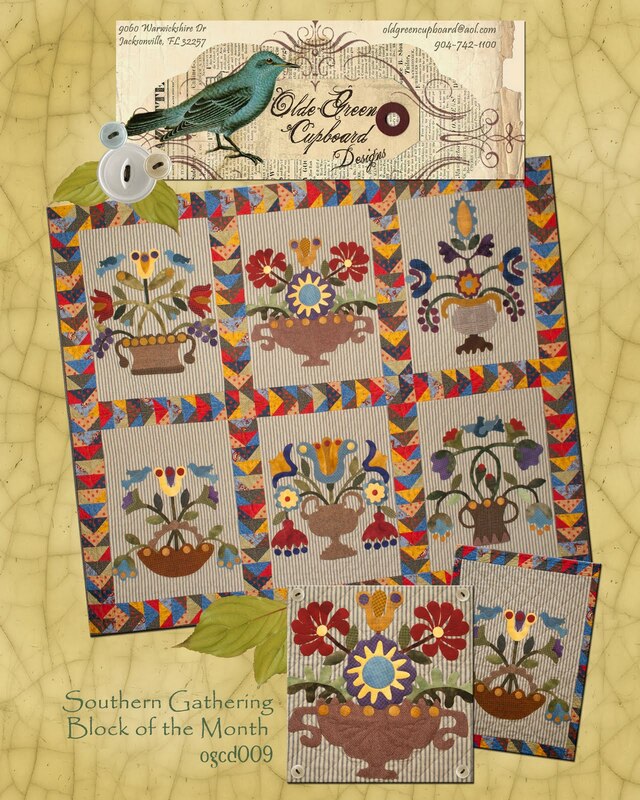 Take your favorite charm pack and some background and before you know it... you've got a gorgeous quilt. 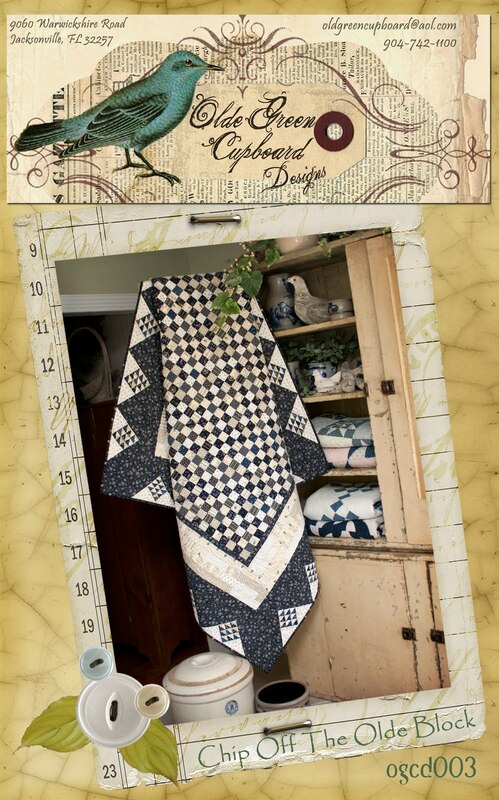 Here is another fabulous scrappy blue and white quilt. look absolutely stunning in my shabby chic primitive yellow cabinet. I found this cabinet in Georgia and it just had to come home with me. 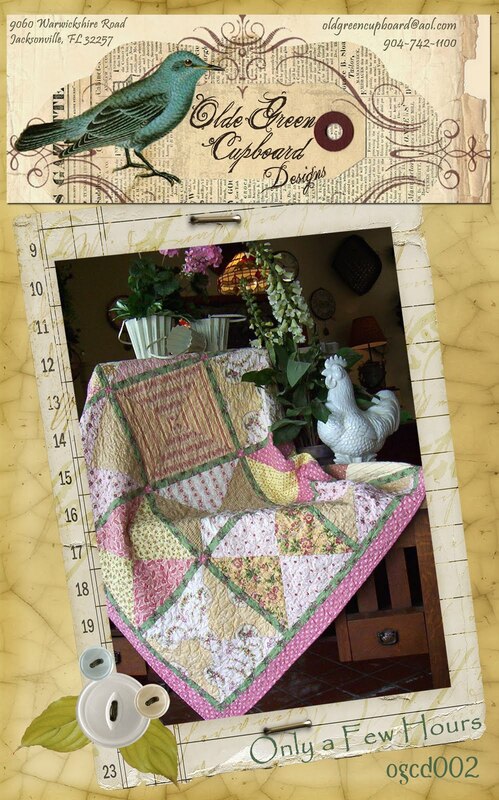 This quilt is gorgeous on a table...with that fancy border.... yes ma'am... its gorgeous! 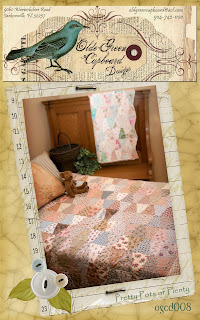 Yes...it is true.. it only takes a few hours to cut your pieces and sew this sweet quilt together. 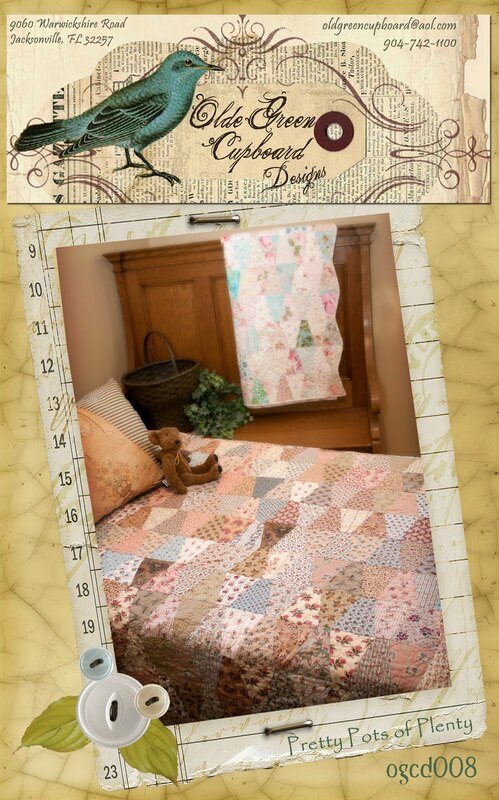 Vicky has made tons of these quilts... from soft pastel to primitive to reproduction. They all look super. 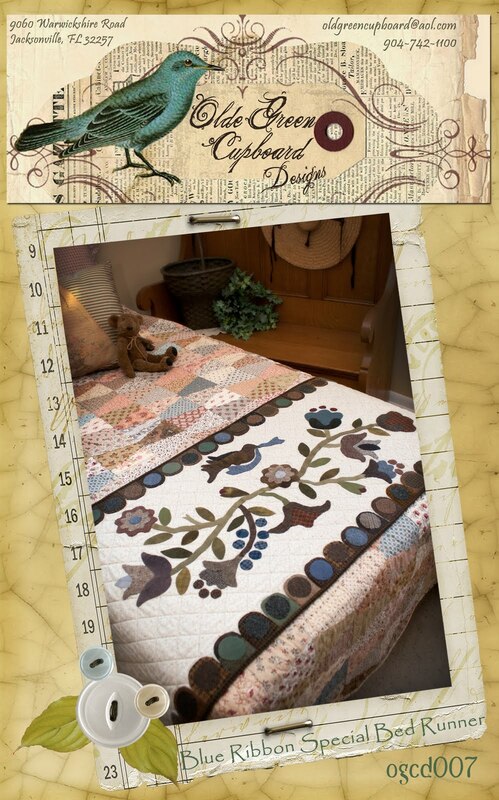 It's a fast quilt to make for a gift and is a great size! 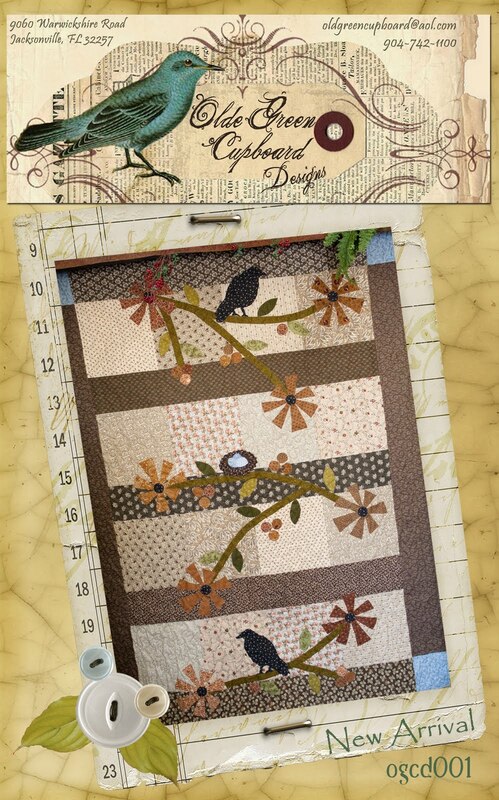 This was a fun quilt to design... a horizontal quilt that is fast to piece.... and great fun to applique. It can be machine or hand appliqued. For a different look, use wool for your applique fabric! Great texture and a super primitive look. Well.. that's it... that's what we will have at market in Houston. We are going to decorate our booth with antiques and hopefully sell them while there! Only one trick... you can buy but you can't have them until be break down at the end of the last day!. In my next posting, I'll show you some pictures of the things we will be taking with us.